WAKEFIELD, Mass. - The Hockey East Association today unveiled the All-Hockey East 35th Anniversary Team, comprised of the league's top 35 forwards and top 35 defenders, including defensemen and goaltenders, as voted on by fans, the league's head coaches, officials and media members. The team is comprised of players from 10 of the 11 Hockey East institutions, including 16 from Boston College, 14 from Boston University and Maine, eight from New Hampshire, six from Northeastern, four from UMass Lowell, three from Massachusetts and Providence, and one each from Merrimack and Vermont. Headlining the team were the two highest vote-getters in Maine's Paul Kariya (719 points) and Massachusetts' Jonathan Quick (695 points.) The other top point-getters were forwards Johnny Gaudreau (699/Boston College), Chris Drury (693/Boston University), Brian Gionta (685/Boston College), and Jack Eichel (679/Boston University) and defenders Brian Leetch (676/Boston College), Ben Bishop (673/Maine), Jimmy Howard (659/Maine), and Charlie McAvoy (659/Boston University). The team consists of 10 Hobey Baker winners and nearly each player selected as the league's Player of the Year over the course of its illustrious history. Additionally, the team features just one current player in Massachusetts sophomore defenseman Cale Makar (Calgary, Alta.) who on Wednesday was named as the sole unanimous selection to the All-Hockey East First Team. Hockey East's Top 35 forwards and defenders were chosen by a fan vote through the league's official website – HockeyEastOnline. 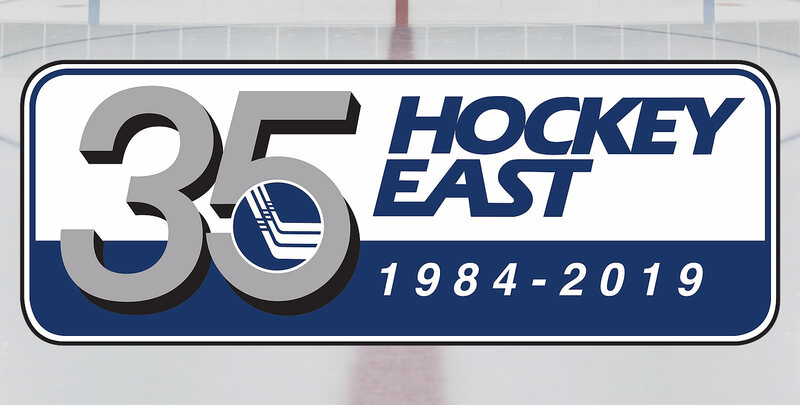 com - and votes from Hockey East's 35th Anniversary Committee, which included representatives from each Hockey East school, members of the media, and the league's head coaches.